of a team building session. The New Hampshire Tax Collectors’ Association sponsors an Annual conference designed to meet the criteria of its mission. The conference is held each fall (September or October) at a central location in the state and is the only opportunity for Collectors to collaborate as a collective group. State RSA 31:8 encourages education of public officials and mandates municipalities to provide funding for this purpose. To assist with these costs, annually the NHTCA provides a scholarship for one new Tax Collector to attend the conference. 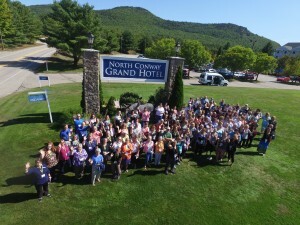 The 2019 Annual Conference will mark the 81st anniversary of the NH Tax Collectors’ Association. The conference will be held October 15-18, 2019 at the North Conway Grand Hotel.